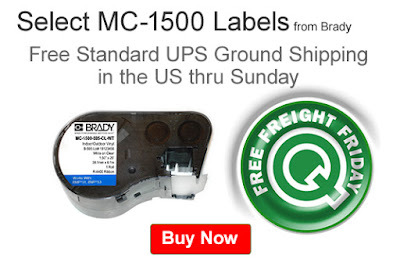 Save shipping costs on select Brady MC-1500 Labels. Get Free standard UPS Ground shipping in the US when you add an eligible label to your shopping cart. Our Free Freight Friday (FFF) promo is valid from today, January 27, 2017 through Sunday, January 29, 2017. These labels are compatible with Brady’s BMP51/BMP53 Label Makers. See the individual label product page for more info. Click here to purchase these labels. For further questions, call us (800-966-6020), or send us an email. Please note: This promo is valid only at QSource.com and expires on January 29, 2017.